For much of Europe’s history, Italy has been a centre for the arts and artists of all persuasions. Many of the great cities of Italy are renowned for their galleries ,museums, and churches which hold some of the worlds great art. Today’s artworks portray three different cities and are an etching, an aquatint, and a watercolour. Please click on rectangle to see image. Do not know why it will not show like all the others. Odd but we begin with a French artist Emile (1796 – 1865) or Adolphe Rouargue (1810 – 1870). I list two artists since my engraving is only signed #Rouargue del et sc. and could be either artist. During his life, he travelled extensively and many of the sties he encountered are displayed in his artworks. The great churches from across France and Italy and sites in the Holy Land are to be found in his work. 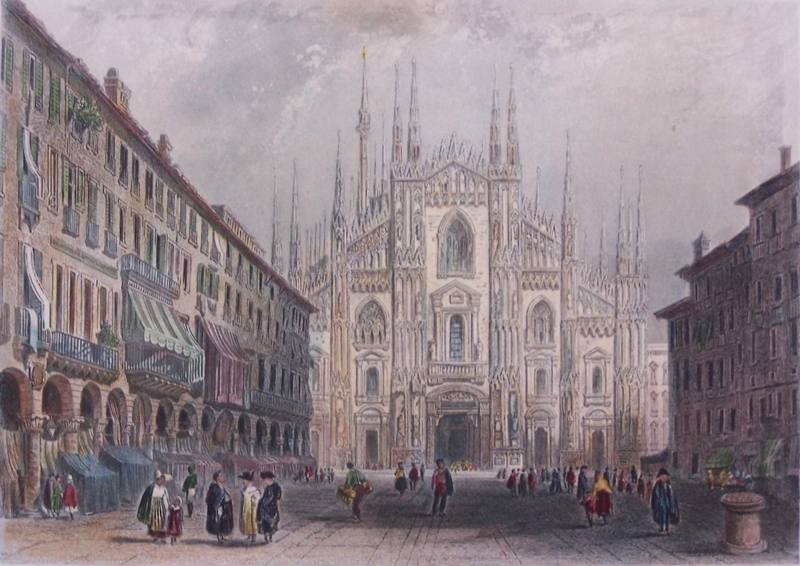 Presented is his engraving of the ‘Piazza Duomo di Milano’. It has been hand-coloured and is a very nice example of the art of engraving. We continue southwards to the city of Rome to the Vatican into St. Peters Square where the next #aquatint is taken from. 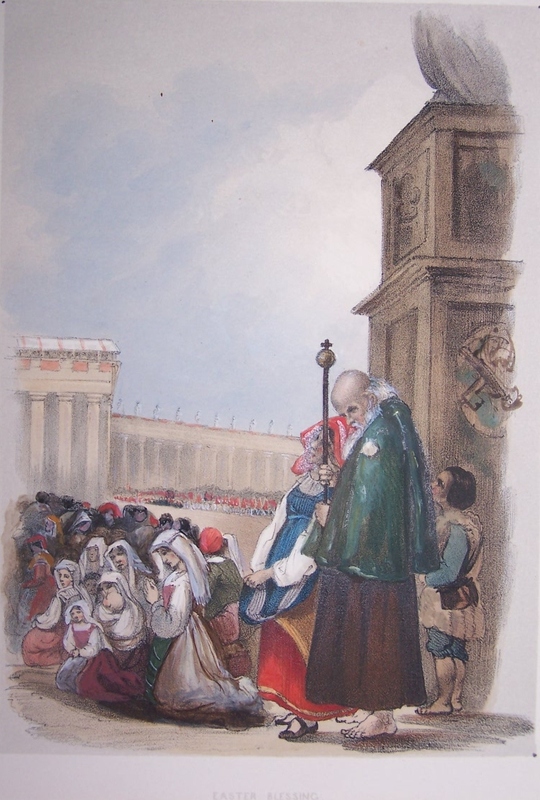 I have no knowledge of the artist but once again the etching has been hand-coloured and I think the etching comes from the 1800’s and might be a page from a large book. It is titled ‘Easter Blessing’ fitting since we are now in the church season of Lent. I do not know who the old priest is but he holds some resemblance to Cardinal Pietro Bembo. And now back to the north of Italy to the beautiful city of Florence. We stand in the ‘Il Campanile da via de Pecori’ looking at the ‘ Church of Sante Maria del Fiore’. The church is particularly notable for its 44 stained glass windows. They are the work of the greatest Florentine artists of their times. The basilica is one of Italy’s largest churches, and until development of new structural materials in the modern era, the dome was the largest in the world. It remains the largest brick dome ever constructed. The historic centre of Florence which includes the Basilica is an UNESCO World Heritage Site – a major attraction to tourists visiting the region of Tuscany. 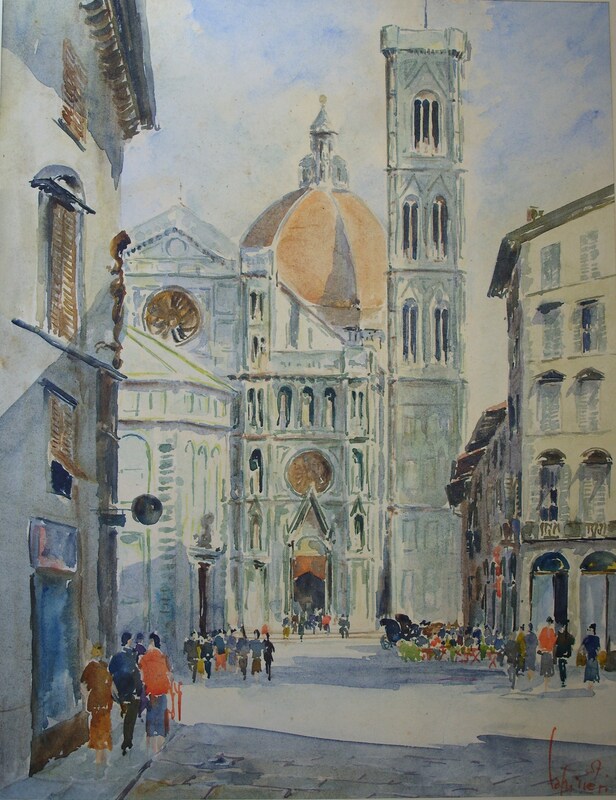 This entry was posted in Etching, Watercolour paintings and tagged blessing, Duomo, Easter, Florence, Milan, nuns, Piazza Duomo di Milano, priest, Sante Maria del Fiore, service, St Peter's Square, Vatican. Bookmark the permalink.